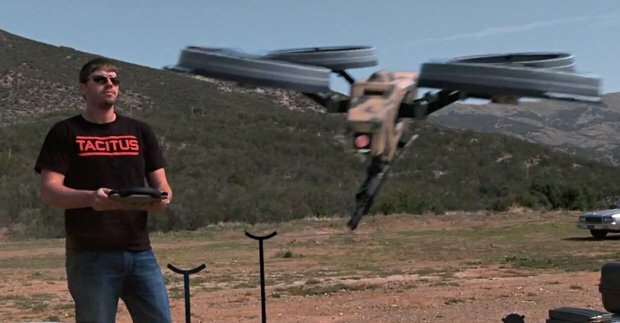 What do you get when you combine a prototype hover vehicle similar to the Parrot AR Drone which can be flown with an iPad and sub-machinegun? Trigger-happy YouTuber FPS Russia recently posted a video showing us just exactly what --"Sharlene". Sharlene can fly through tight spaces, and even blow itself up on command. The quad-rotor prototype includes a 100 round magazine, can fly 30 MPH, reach altitudes of over 1000 feet, and self-destruct with a 15-foot blast radius. Or that's the premise, anyway. It's more than likely that this is all fancy CG work, since the video was sponsored by the fine folks at Call of Duty, who have a game being announced on May 1 likely called Tacitus. Even if it's fake, the U.S. Military is knee-deep into significant iOS usage. Not too long ago, the Army launched a web app store for iOS and Android, and even two years ago snipers were using iPhone apps to calculate trajectories. Even if the military has their own proprietary flying gun drones available, I imagine it would be a lot cheaper to have troops on the ground kitted out with iPhones than expensive custom-built consoles. FPS Russia says that because it's a prototype, we wouldn't see this thing for another decade; even if it's all smoke and mirrors, do you think we'll see gadgets like this on the battlefield within the next ten years?